Touch of a Yellow Sun (Colors of Love #2) by V.L. Locey 4 Star Review!! It’s been a rough couple of years for Marek Hafer, roaming hockey protagonist and pugilistic expert. Ending up in Berger Lake, Pennsylvania, on a financially unstable minor league team might just be the ending his wretched career deserves. On the other side of thirty, Marek knows his time on skates is dwindling. His goal now is to spend a few quiet years playing for the Berger Lake Badgers, knock a few helmets together as needed, and then call it quits before his salty personality gets him booted out of hockey permanently. After a bloody encounter his first night on the ice, the Badgers coach suggests that Marek find a way to lower his violent tendencies before he’s sent packing yet again. That decree leads Marek to knock on the door of his next-door neighbor, Shey Pierson, the owner of Sun Touch Yoga Studio. Shey ticks every box Marek has with his soft blue eyes, flowing golden hair, and long limber legs. The only problem is that Shey is yin to Marek’s yang. Can a man famed for throwing punches find serenity in the arms of a man known for his tranquil ways? V.L Locey writes a lovely character driven sports romance with opposites attract at its heart. Our yoga instructor hero, Pierson, is a mystery that slowly reveals itself and he has a great cat. I would love Pierson to get some the same deep character work that Marek got. Everything that Marek does makes sense and his personal path to happiness is really a wonder. Complex, grumpy, and shut down, Marek blooms as he falls in love with Pierson. The plot goes drifts off course in places with a bit too much in the mix but the romance is always on point. 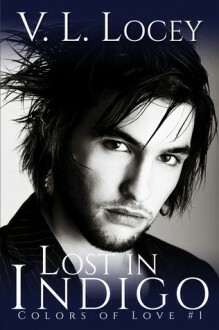 A while ago I was given the opportunity to read a book entitled ‘Lost in Indigo’ by V.L. Locey and I really loved it so when the opportunity came to read and review the second book in this series ‘Touch Of A Yellow Sun’ saying anything other than ‘oh hell yeah!’ wasn’t even an option and once again I loved the story that I was presented with. While I really loved this story I have to admit at times I struggled with the character of Marek Hafer, but in the end I was won over by Marek and then there was Shey…I cannot lie I loved Shey just for his name…ok, maybe not just for his name but honestly I just love the name Shey, so he had brownie points before I even started reading the story. Now the story…Marek Hafer has anger issues and while one might think this could be a bonus for a hockey player...it’s not since often times decisions made in anger are not made with good judgement and Marek frequently displays poor judgement both on the ice and off, but he’s also got issues…issues that cloud his judgement and contribute to his ongoing anger. Marek’s got a past that’s filled with pain and hurt and unanswered questions. Shey Pierson is Marek’s new neighbor and Marek quickly comes to realize that Shey is also a source of a peace and calm that Marek has rarely if ever known in his life and while his initial attraction is more about lust than love as the two men get to know each other those feelings begin to change. Shey teaches yoga classes for a living and he’s as drawn to Marek as Marek is to him, but he also sees the internal turmoil that Marek’s fighting with and he wants to help him find peace. Shey definitely made Marek want to be a better person, while Marek helped Shey to lighten up a little and then there was the tea…so much tea!!! Shey reminded me of a dear friend whose solution to all things like Shey was to make tea. I loved it. The lesson here…when in doubt make tea! And one of my absolute favorite parts of the story was a sweet little meesie named Chula. I’ve got a huge soft spot for Siamese cats so Shey having one and the fact that Marek loved Shey’s cat as much as I did pretty much guaranteed that at the end of it all I was going to adore these two men. But if that wasn’t enough there was the fact that I really enjoyed their interactions…well this one started out good and for me just kept getting better and better. Marek and Shey were two very different men and yet they both had a common problem that took a different form for each of them…both men had things in their past to deal with and I loved that they did this together…giving each other the love and support they needed to deal with the challenging things and move on. If you didn’t read ‘Lost In Indigo’ and for whatever reason it’s not your thing but this one appeals to you, reading it without benefit of that story is a total non-issue there is zero overlap in terms of story lines and the only character from that book that appears here is Marek’s agent…so like I said it’s definitely a non-issue to read book two even if you skipped the first one. ‘Touch Of A Yellow Sun’ was a feel good story that just needs a cozy chair and a cup of tea to round out the reading experience and maybe a cookie or two would be nice while you’re at it. A copy of ‘Touch Of A Yellow Sun’ was graciously provided by the author in exchange for an honest review. It's been a rough couple of years for Marek Hafer, roaming hockey protagonist and pugilistic expert. Ending up in Berger Lake, Pennsylvania, on a financially unstable minor league team might just be the ending his wretched career deserves. On the other side of thirty, Marek knows his time on skates is dwindling. His goal now is to spend a few quiet years playing for the Berger Lake Badgers, knock a few helmets together as needed, and then call it quits before his salty personality gets him booted out of hockey permanently.